Yesterday’s homeroom is today’s science lab. Throughout the Archdiocese of Baltimore, schools are finding new purposes for old space. Whether in response to changes in enrollment or the 21st-century emphasis on science, technology and math, schools are converting portions of their campus as needed. An abandoned high school in Towson becomes a boon for seventh-graders whose needs differ from their younger siblings. A portion of a multi-purpose room in Catonsville is refitted for a pilot curriculum. A Hagerstown school knocks down a wall and creates a science lab. The Catholic Review looks at the transformative power of those projects at three parish schools. Space was such an issue at Immaculate Conception School in Towson that Greg Mansperger was forced to teach music “a la carte.” During the 2009-10 school year, he moved from homeroom to homeroom, guitar in one hand, the other pushing a cart loaded with “Gather” hymnals. Today, he is based in a spacious classroom. It enjoys a view north to the Loch Raven watershed, but minds have no need to wander there, as his first-graders “have room to get up and dance,” seventh-graders learn the 12-bar blues on the ukulele and he teaches music history by sharing Bach and Beethoven on the piano. Mansperger works in what was a math classroom at the former Towson Catholic High, which closed in 2009 in response to enrollment declines. That vacant space has been gradually used by the adjoining parish elementary, which last October was named a National Blue Ribbon School. Down to 535 students in 2007-08, Immaculate Conception has 576 this year. Towson Catholic had allowed it use of its auditorium, cafeteria, gymnasium and playing field – when they weren’t being used by the high-schoolers. The Home School Association is staging an auction March 28, aimed at replacing the 550 chairs in the auditorium, but the biggest benefit can be seen in the instructional environment. The parish Boy Scout Troop helped convert the old TC library to a multipurpose room, used for everything from meetings to recess to the religion class that includes all eighth-graders, who are taught by Father Joseph F. Barr, pastor, or Father Steven P. Roth, associate pastor. Down the hall, a former high school classroom is a good fit for today’s middle-schoolers, who are larger than their peers were 50 years ago, be it from fortified food or the fact that children born late in the calendar year are discouraged from entering grade 1 before they turn 6. Pre-schoolers who were once in the old “Brown House” on the east side of campus are now in the elementary school, where visual stimulation appropriate for a 6-year-old isn’t necessary for a 13-year-old. As director of Government Programs for the archdiocese’s Department of Education, Julia Rogers wrote the grant proposal that brought $336,000 in federal funds for use at four community schools in the city. Archbishop Borders, Cardinal Shehan, Holy Angels and Ss. James and John are using those funds in extended-day programs in science, technology, engineering, arts and math (STEAM). Now, as interim principal of St. Agnes School in Catonsville, Rogers is implementing something similar, transforming a corner of the multi-purpose room into a station for the “project-based” curriculum designed by Destination Imagination. Four new tables were placed in that room Jan. 9, with three more on the way. It is equipped with a mobile white board, 10 new Tablets and as many laptops. All that cost just $5,000, and came out of the school budget. 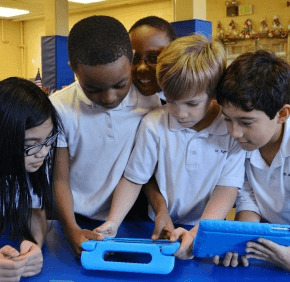 During the regular school day, and the extended day program, which includes 50 of the 200 students at St. Agnes, students and their teachers will use the technology on weekly STEAM challenges. Toward that end, Rogers and Gail Donohue, Notre Dame of Maryland University’s director of Academy of Catholic Educators and faculty in residence at St. Agnes, coach the staff. “Gail works with faculty and staff on how to implement technology and interactive learning in the classroom,” Rogers said. St. Mary Catholic School in Hagerstown is celebrating its 140th year – and its fourth in a new science lab, thanks to a $60,000 grant from the Marion I. and Henry J. Knott Foundation, and matching funds raised by the school community. St. Mary previously had a small, cramped science lab, next to a classroom being used for language arts. Down came the wall, and in the resulting space, which measures 1,416 square feet, hands-on learning is considerably less problematic – and safer. “Before, we had to put down power strips on the floor, and you had to be careful that students didn’t knock microscopes on the floor,” said Patricia McDermott, principal. Then, as many as eight students could be crammed around a lab table. Now, it is two to a table. Her sixth-graders are studying earth science, the seventh-graders life sciences and the eighth-graders energy. As the weather warms, some will venture out to Antietam Creek or Harper’s Ferry, and analyze water samples that will give them a hands-on appreciation for the health of the Potomac watershed. Two years ago, St. Mary used another Knott grant to purchase iPads for its middle-schoolers. McDermott and her development director, Debbie Bockrath, point to the science lab as a concrete improvement that helped grow enrollment, which runs from preK-4 to grade 8, from 208 students in 2013-14 to 229 this year.